Permission to the Recruiting Agencies – Orders – Issued. Government is contemplating filing up vacant posts in various departments through Direct Recruitment in that direction, vide reference second and third read above, the Secretariat Department and the Heads of Department were requested to furnish a list of vacancies that can be filled in through Direct Recruitment. In response, proposals were received from the Heads of Departments through the respective Secretariat Departments. 2. The proposals have been examined and it has been decided to fill in the vacancies in a phased manner. Accordingly, Government hereby accord permission to fill in Ten Thousand (10,000) vacancies in different categories including the categories that are classified as Group-I, Group-II and Group-III Services, other gazetted, non-gazetted and technical categories in various departments, through direct recruitment. Of these 4009 posts come under the purview of A.P. 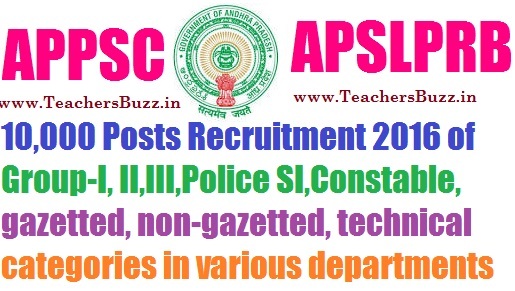 Public Service Commission and 5991 posts come under the purview of A.P State Level Police Recruitment Boards shown in the Annexure to this order.